ALU: A twenty year low and the chart is on a log scale. I think stocks make twenty lows because there are real problems with the business and the balance sheet. I understand the balance sheet and pension issues which I term as structural, but the real problem is designing and building compelling solutions that can be sold at profit to support the business model. The business model and the market are on orthogonal trend lines. Can the company build compelling solutions and source those solutions to their customers at a high enough profit margin to support the company? The stock price is telling you that the company has too many legacy issues to support and this is preventing the company from finding a way to be a winner in their end markets. Within their end markets there is little profitability in wireless and service providers are evolving towards the bits r us conundrum that I have written about previously. Tough business model to fix without real demolition to parts of the business. AONE: This was a darling stock in 2009 for the green revolution. Today, it is partially owned by the Chinese and worth 27 cents a share. Someone owes a lot of people some explanations. 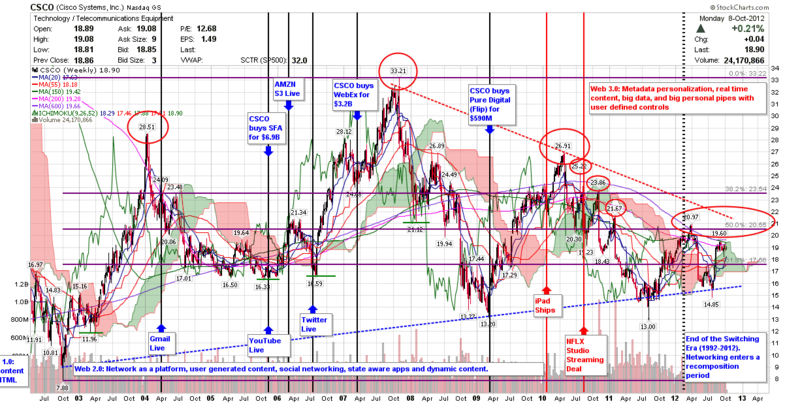 CSCO: I have read the recent buy reports on CSCO and all the speculation about infrastructure upgrade cycles and positive channel checks, etc. That is all well and good and in reality land only a few people really know and they are not telling. What we do know is the stock has been in a downward channel since February 2010. It had a bounce off the bottom from mid-2011 to early 2012, but readers should note the series of red circles. That is called a series of lower highs and the stock has failed at the 50% fibb on a weekly basis. Cisco is closing their fiscal Q1 this month and will report in November. The multi-year wedge from late 2007 looks to be resolving itself as we head into the Q1 report. The 61.8 fibb and bottom support line are critical levels to hold for November and I would submit it will be a function of margins and guidance. Margins need to hold and the company has to show some organic revenue growth — it cannot be a buyer of revenues through M&A. If it is not a grower, than it needs to increase the dividend, but unlike IBM over the years, I am not certain margins can go higher. At the end of the day, CSCO is a hardware company and the stock works higher if the market is consuming CSCO hardware. DELL: Not a lot working for DELL in the category of product cycles. The stock is approaching the depths of the credit crisis lows. They are more of a diversified IT company these days with Perot, Quest, Wyse, SonicWALL, Force10, Compellent, EqualLogic, ASAP and handful of software/SAAS companies. 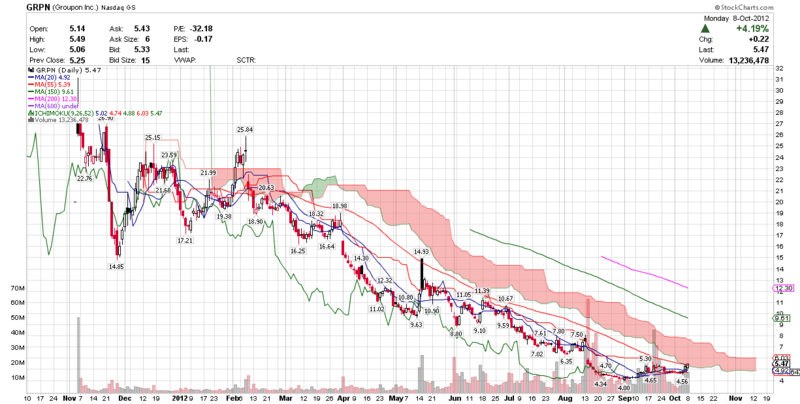 GRPN: I was negative on the GRPN IPO and at $4.56 I think it would have been better to sell the company before the IPO. Does anyone remember the rumors of a Google deal before the IPO for $2.5B or the $5.3B offer with $700M earn out in late 2010? It is worth $3.58B today and was worth $13B at the time of the IPO. Hard to know which was the better choice, but Google’s stock has been on a tear lately and I have been known Google bull for some time. HPQ: I put this chart up over the weekend, but I made some tweaks to it. The correlation, real or by chance, with the iPad launch is just amazing. ZNGA: I am a believer that tech stocks work to the upside when margins and revenues are expanding. Margins are more important than revenues, but both are needed. I wonder if the ZNGA should have taken the company public a year or two earlier and rode the growth curve in social gaming, which would have fueled a multiple expansion, rather than waiting till they were bigger to go public. The same might be true for FB too.